Worst affected over the morning was the three-month zinc price, which fell just over 3% to trade below $2,400 per tonne and at its lowest level since September 2018. According to LME data on December 31, there remains one dominant warrant holding position currently holding 50-79% of total zinc stocks. LME zinc stocks are at their lowest since 2008. Similarly, nickel futures continue to trade in a persistent downtrend, dropping to an intraday low of $10,545 per tonne, the metalÃ¢â‚¬â„¢s lowest price since December 2017. LONDON Ã¢â‚¬â€œ The London zinc market is experiencing unprecedented tightness this week. As of MondayÃ¢â‚¬â„¢s close, the London Metal ExchangeÃ¢â‚¬â„¢s (LME) benchmark cash-to-three-months spread CMZN0-3 was valued at a backwardation of $97 per tonne. Woodlawn copper-zinc project to Pybar Mining Services and expects annual production of 40kt zinc between late-2018 to early-2019. Fitch Solutions Macro Research has just published its outlook for global zinc production. Globally, mined zinc production continues to ramp up over the coming years as elevated prices encourage miners to restart idled capacity and key new mines come online, according to the report. Fitch forecasts global mined zinc production to increase by 3.5% in 2018, to 13.7mnt, and rise to 16.8mnt by 2027. The report focusses on industry trend analyses in Australia, Canada, Peru, China, The U.S., Kazakhstan, Mexico, Namibia, India and Iran. 1- India clinches the title for largest zinc mine with Rampura Agucha. 2- Red Dog in the U.S. The report predicts that China's zinc production will stagnate due to declining ore grades and increasingly stringent environmental regulations, China will remain a key player in global zinc mine production. Belgian zinc producer Nyrstar issued a profits warning last week, citing Ã¢â‚¬Å“adverse market conditionsÃ¢â‚¬Â. The company, which last year produced over 1mn tonnes of refined zinc, is feeling the pain from the dramatic price collapse of the last six months. 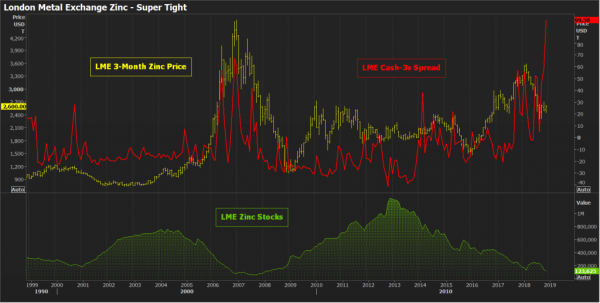 The resulting price implosion has opened up a disconnect with zincÃ¢â‚¬â„¢s internal supply-demand dynamics. Right now the zinc price is suggesting that a wave of new mine supply is crashing along the supply chain. It isnÃ¢â‚¬â„¢t. Treatment charges, which is what companies such as Nyrstar receive for processing mined concentrate into refined metal, are still Ã¢â‚¬Å“historically lowÃ¢â‚¬Â, compounding the financial hit from the low zinc price. Nyrstar, like other smelters, is being squeezed between a price thatÃ¢â‚¬â„¢s signalling feast and a raw materials chain that is only just emerging from famine. They are coming, but itÃ¢â‚¬â„¢s taking time. South32 has made a $US1.3 billion ($A1.75 billion) bid to take sole ownership of US-focused Arizona Mining. The Australian business, which already owns 17 per cent of the zinc, lead and silver miner, says the directors of Arizona Mining will unanimously recommend shareholders accept the all-cash offer. South32 chief executive, Graham Kerr called Arizona Mining's Hermosa Project in Santa Cruz County, Arizona, "one of the most exciting base metal projects in the industry". Zinc hit a four month low of $3,135 a tonne on Thursday, down more than 12% from its decade high achieved mid-February. Rising fears about trade protectionism have taken the shine off most base metals but zinc's bearish outlook has more to do with new supply; and lots of it. The metal, mainly used to galvanize steel, has more than doubled since hitting multi-year lows in January 2016 after the shutdown of major mines including Australia's Century, the Lisheen mine in Ireland and top producer Glencore's depleted Brunswick and Perseverance mines in Canada. Just to throw fuel on the fire the Swiss giant curtailed production at its operating mines in Australia. But in December Glencore said it would restart its Lady Loretta mine while keeping its total output steady at under 1.1m tonnes. New mines include MMG's Dugald River project in Australia (170ktpa since November for 28 years), Vedanta's Gamsberg mine in South Africa (250ktpa with 30 year life-of-mine) and the Castellanos operation in Cuba (100ktpa for 22 years). The Century mine is also getting a new life and tailings retreatment at the giant mine is enough for an additional 264ktpa. Further out there is also no shortage of additional supply. Among others, major projects that could be brought into production in the medium term include Arizona Mining's $1.2 billion Hermosa project (95ktpa), Ironbark's $500m Citronen project in Greenland (up to 200ktpa) and the $890m Khnaiguiyah project in Saudi Arabia (80ktpa). Swiss miner and commodities trader Glencore (LON:GLEN) has begun hiring for a number of new positions at its Lady Loretta zinc mine in Australia, which is slated to reopen in the first half of this year. Production at the Queensland-based operation was halted in 2015 because of falling zinc prices. Since then, the metal has more than doubled, so Glencore Ã¢â‚¬â€ the worldÃ¢â‚¬â„¢s No.1 zinc producer Ã¢â‚¬â€ announced in December it would resume mining at Lady Loretta. According to Townsville Bulletin, the restart will create 250 jobs, including project and geotech engineers, maintenance managers, shift supervisors, mechanics and dozen other positions. The reopening is planned in phases, with the mine expected to produce 100,000 tonnes of zinc this year and an additional 60,000 tonnes in 2019. Other than that imminent supply there is additional capacity coming online in the short term, including MMG's Dugald River project in Australia and Vedanta's Gamsberg mine in South Africa.